The scope of this volume is intentionally broad. We review applications of spatially realistic occupancy models and age- or stage-structured demographic models as well as individual-based demographic models. These three main Population Viability Analysis (PVA) approaches initially are compared with other conservation assessment tools in an overview by Akcakaya, Lacy and Sjogren-Gulve and Hanski, with a special chapter on plant PVAs by Menges, all using illustrative examples. Fleishman et al. subsequently outline how nested subsets analyses can help discern focal species, taxa whose habitat requirements may encompass those of larger species groups and can be subjected to PVAs. Kindvall then compares the predictive accuracy of simpler occupancy models versus a democratic model for predicting local extinctions and colonizations in a bush-cricket metapopulation. Thereafter, four case studies which use the three model categories are presented (papers by Berglind, Ebenhard, Lennartsson, and Vos et al.). The volume concludes with Gardenfors' paper on the use of PVAs in the classification of threatened species, and Lacy's presentation of the structure and logic of VORTEX, a widely used demographic and genetic PVA model. 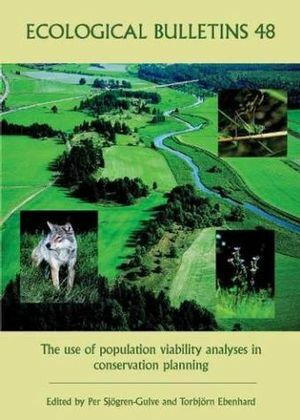 P. Sjogren Gulve and T. Ebenhard are the authors of Ecological Bulletins, Bulletin 48, The Use of Population Viability Analyses in Conservation Planning, published by Wiley. Preface P. Sjogren-Gulve and T. Ebenhard. Population viability analyses in conservation planning: an overview H. R. Akcakaya and P. Sjogren-Gulve. Population viability analyses with demographically and spatially structured models H. R. Akcakaya. Considering threats to the viability of small populations using individual-based models R. C. Lacy. Metapopulation viability analysis using occupancy models Sjogren-Gulve and I. Hanski. Focal species modeling for biodiversity conservation E. Fleishman, B. G. Jonsson and P. Sjogren-Gulve. Comparative precision of three spatially realistic simulation models of metapopulation dynamics O. Kindvall. Management and population viability of the pasture plant Gentianella campestris: the role of interactions between habitat factors T. Lennartsson. Demography and management of relict sand lizard Lacerta agilis populations on the edge of extinction S.-?. Berglind. Population viability analyses in endangered species management: the wolf, otter and peregrine falcon in Sweden T. Ebenhard. Incidence function modelling and conservation of the tree frog Hyla arborea in the Netherlands C. C. Vos, C. J. F. Ter Braak and W. Nieuwenhuizen. Population viability analysis in the classification of threatened species: problems and potentials U. Gardenfors.